We're currently house sitting (been doing that a lot over this xmas break). Now at my sister in law's place looking after a cat. One of the difficulties in being a nomad is my desk! I haven't got it set up right anywhere yet. Not even at my mother in law's place and even in Peakhurst when we hadn't settled in properly the desk or bench in that case was only temporary. I have been inspired by a number of IKEA hacks found on the internet but I'm quote happy with what I came up with by scrounging around. The box is 22cm high. I found a bluetooth media keyboard (which has an inbuilt trackpad - helps as there is no room for a mouse on this box!). 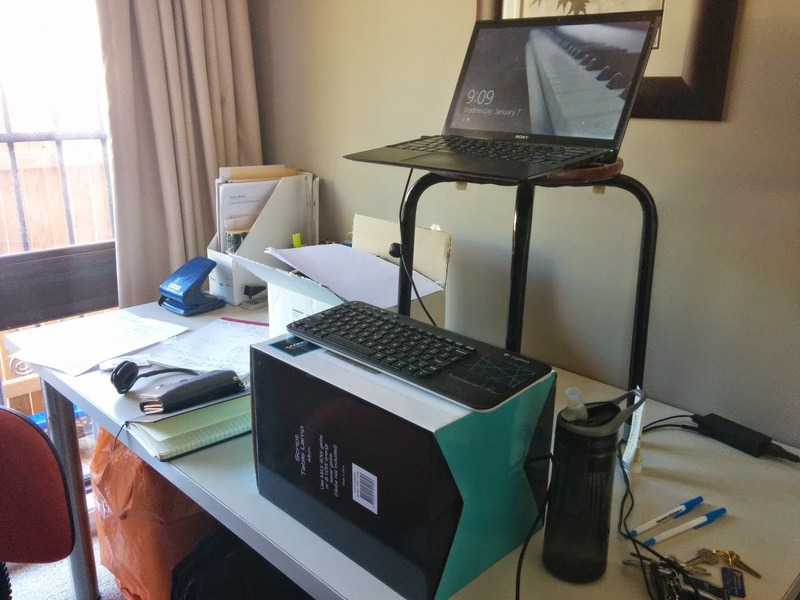 The stool is a further 23cm taller than the box so my laptop is sitting on 55cm above desk height. It could be a bit taller but not much more. This is good for my height. The desk is a standard height at around 73cm. For comfort, the keyboard could sit a bit lower (or I could be a bit taller!) as my elbows are almost 90 degrees (which is meant to be ideal) but I think my hands want to be just a bit lower again. Also this box doesn't have the width for me to pop my mouse in a good spot which I'd prefer. I'll have to show you a photo of my makeshift standing desk at my MIL's place too when I am back as that isn't that much better -- actually some of the boxes I've used are even more precarious -- I'm using a cardboard box for the laptop but at least the monitor is standing on a guitar amp (photo will explain better). So anyone wanting to try a standing desk this is probably a good solution for you to give it a go without investing anything. No special tools, no installation required. Just a stool (or you could use a chair) on a desk and then a box or something else to prop up a keyboard and mouse. For those who want to get fancy and see the 'aha' IKEA hack article, check out the Standesk. Supposedly $22 but that is using US IKEA pricing. In Australia (Eastern), IKEA is a bit more. Total cost based on the original recipe in Sydney is $27.98 or $28 as we get rounded up anyway. Or you can do it for a bit cheaper at $20 with the Laiva and Stödis.